When I was working in my last administrative role, I was constantly taking documents from years ago and attempting to create more streamlined, easy and simple templates for other people in the office to use. Not only was it time consuming and tedious, it was just plain boring. I would venture to say that many people have this same problem of trying to transform old, boring documents into better ones. But, what if there was a way to do it quickly and easily? Oh yes. Hello, Doccy. Doccy is all about saving time and effort. Both of those things equate to money. So, listen up. If you’ve got loads of documents that need to be turned into templates, Doccy is your app. It’s like a mail merge online and set-up is as easy as 1-2-3. Upload a template – Doccy lets you upload existing templates (unlike most services that make you fill out theirs online) and supports Word, Pages and Open Office documents. Fill in the placeholder form – When you need to send out a new template, you simply type in the info into Doccy’s simple to use form. Send out documents – After you’ve filled in the blanks, you can send the doc straight from Doccy or from your own email client. According to Doccy Founder Michael Cindrić, the whole process takes literally 20 seconds. He created the app after his software company was wasting a lot of time sending out all type of documents like NDAs, development agreements, etc., and he wanted to create a way that would easily turn these documents into templates to save not only his company, but other companies time and effort. And, it was developed so anyone can use it. Simple, easy and efficient. One of the best features of Doccy is the Dropbox syncability. That may or may not be an actual word, but I love it. It stays. 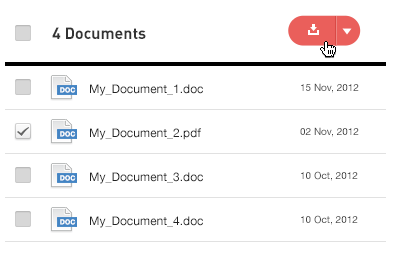 When you connect your Dropbox to Doccy, it will automatically sync a copy of the document to your Dropbox so you can access it anywhere. Gotta love the convenience of the Cloud. Doccy has 3 pricing packages including, Basic with 3 template uploads ($29/m), Professional with 10 uploads ($49/m), and Company with unlimited uploads ($99). And, Doccy is offering a 30-day free trial, so you can test it out for yourself. Stay tuned for the Doccy API and mobile app coming soon. I’ve tried it out, and I can vouch for Doccy’s simplicity and efficiency. If you’re a company sending out loads of documents on a daily basis, do yourself a favor and check out Doccy. You’ll save time, effort and money. Basically, you can’t go wrong.